The NBMBAA Central Florida Chapter is a 501 (c) 3 non-profit organization serving the local I-4 corridor community. We are committed to the success of our members and the overall economic empowerment of our community. We thank our partners for supporting our mission and our members for helping to realize that mission. Greetings and Welcome to the website of the Central Florida Chapter of the NBMBAA. I am honored to serve as this chapter’s President; following in the footsteps of distinguished men and women who pioneered the way before me. This year, the Chapter’s vision is to build upon the foundation by which the organization was founded, by recognizing and utilizing the talents of all those who serve our organization and community. Together, with common purpose, we can make a difference. It is my pleasure to welcome you to the Central Florida Chapter of the National Black MBA Association, Inc. We are committed to impactfully serving our members, partners and community. about our organization, join us at one of our upcoming events and support the mission of the NBMBAA. The National Black MBA Association is the premier business organization serving Black professionals. Incorporated in 1998, our local Chapter currently serves over 230 active members. The Central Florida Chapter of the National Black MBA focuses on the creation of intellectual and economic wealth that improves the financial condition of black business. This is done through our local professional development programs. Nothing beats the entrepreneurial lifestyle! You have full control over your destiny, freedom to travel, and ability to spend more time with family. ....so we think! 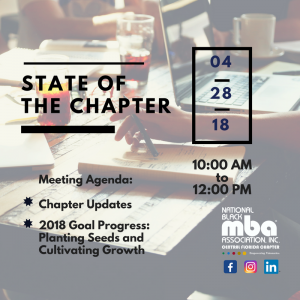 Join us for our State of the Chapter Meeting 2018. At this meeting we will be providing Chapter Updates, 2018 Goal Progression Updates, and discussing the upcoming programming schedule. This is also a wonderful time to Mix and Mingle with your fellow chapter members, don’t miss out! Come Meet and Mingle with fellow chapter members for fun and networking! 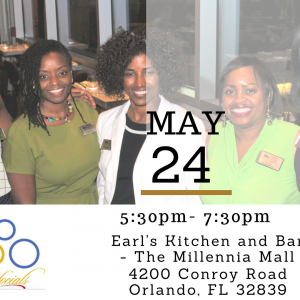 Join us for an evening of networking and fun among Central Florida’s chapter members and Orlando Executive Professionals.